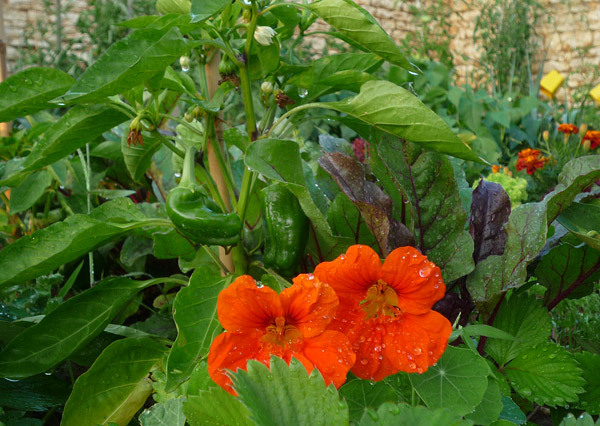 After all the hard work in planting seeds, battling against pests, coping with extreme weather and controlling weeds, the greatest pleasure from tending a vegetable garden has to be eating your own produce. This year is one of the best. Despite the heat and the drought, rain in July has given rise to the sort of lush growth I hope for and every day sees me bringing another hoard of vegetables into the kitchen. Last week, we enjoyed Nigel Slater‘s idea for roast tomatoes with fresh thyme. Just place halved tomatoes close together cut side upwards in a dish with a sprinkle of olive oil, sprigs of fresh thyme, season and bake for 40 minutes in the oven (temperature 200 °C). They were absolutely divine. The flavour was so concentrated and the juice had almost caramelised in the dish. But now I need to get serious and preserve. 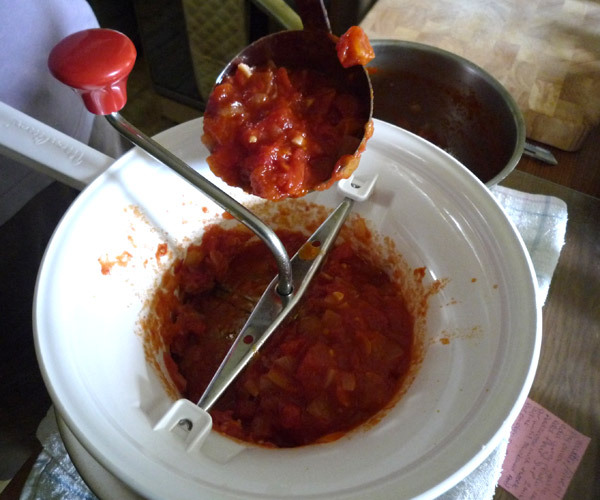 Yesterday I was processing tomatoes to make tomato and tomato and chilli sauces so we can enjoy their fresh flavour well into the winter. There are so many variations on making sauces but I’ve found that these two simple sauces are the most useful. I don’t measure ingredients, it’s largely guesswork and experience but nothing will be wasted if you find you need more or less of something, you can always adjust it the next time. Firstly, roughly chop 2/3 onions and fry them gently until softened in a generous amount of olive oil. Add a couple of cloves of finely chopped garlic and for an arrabiata type sauce, one or two fresh chillis from the garden according to taste (powdered chilli is OK if you don’t have fresh). While the onions are cooking, skin the tomatoes and roughly chop them removing any woody core. You can remove seeds if you want, but I leave them. They’re OK in an unblended sauce, and if you prefer a smooth sauce you’ll remove them later. 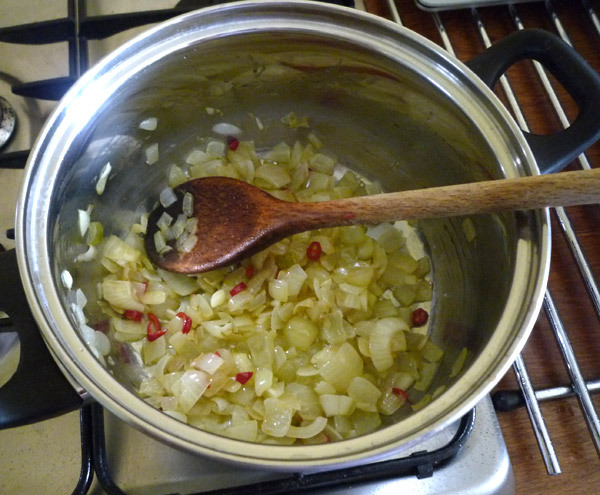 Add the chopped tomatoes to the onion, stir and leave them to gently simmer until most of the liquid has evaporated. Stir occasionally to stop the mixture from sticking to the pan. It should take about 40 minutes for a large pan full of sauce. Leave the mixture to cool. Now you have a choice. According to your preference you can leave the sauce as it is or whizz it up into a delicious smooth sauce packed with flavour. 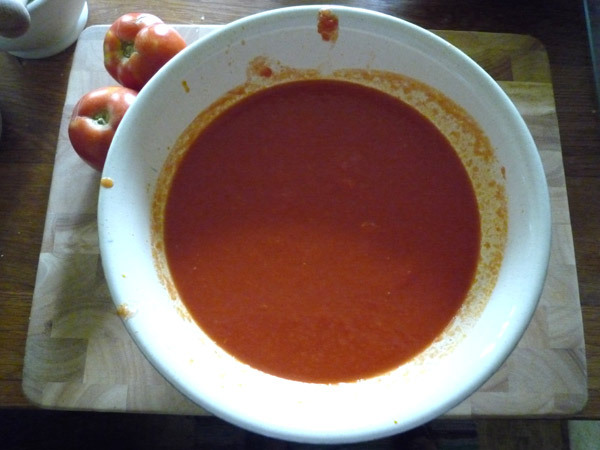 Either use a mouli or whizz it in a blender and push the sauce through a seive to get the sauce to a consistency similar to passata, except yours will be a hundred times better. Don’t forget to season the sauce when you come to use it, salt and freshly ground black pepper will enhance the flavour. The sauce freezes really well – I measure portions into freezer bags but containers are better if you have them. By the way, this tomato sauce, either version, goes superbly well with the delicious Savoury Courgette and Rosemary Rice Cake recipe.